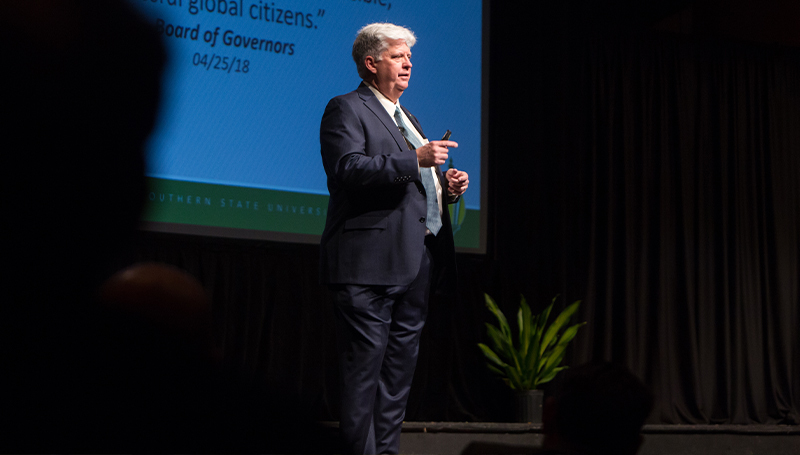 Two types of challenges were at the center of Dr. Alan Marble’s remarks during the Welcome Back meeting held Jan. 11 in Taylor Performing Arts Center. The “destructive challenge” can be found in a narrative that diminishes the importance of higher education – that it should be limited to job training; that it’s too expensive; that college degrees aren’t worth much. During the meeting, members of the university’s administration offered updates on a number of campus priorities and programs. A new residence hall with an occupancy of 292 students is on the drawing board, potentially opening in Fall 2021. A task force has been convened to look at the new minimum wage increases and what that means for Missouri Southern. Starting Jan. 14, all employees and retirees will have free use of the Beimdiek Recreation Center. Missouri Southern will host the MIAA golf championship tournament April 22-24 at Shangri-La. Southernfest 2019 is set for Friday, July 26. It will begin with the Rod Smith Golf Tournament at Twin Hills, followed by the Lion Pride dinner and auction at the North End Zone Facility. The HLC team has set Feb. 4-5 for their visit to Missouri Southern. A full collection of the reports gathered in preparation are available on the J Drive. Fall 2019 will be the Oceania Semester, with events planned to celebrate the region that includes Australia, New Zealand, Papau-New Guinea and Micronesia, as well as Hawaii and Guam. Since opening last fall, the Lion Co-op food pantry has been utilized 90 times by 60 students. Departments and programs are still being considered for the university’s downtown presence in the former Joplin Public Library building. The next ITS Friday event will be offered on Friday, March 29. Dr. Katie Kilmer will discuss the bee colony that has been created on Missouri Southern’s prairie land. The Great Game of Education continues, with a new critical number becoming a major focus – fall-to-fall admission. The push will be to strategically grow enrollment and increase student retention.